Sathiguru Maharaj Sahib Jee says that maerai - within, my heearai - within my heart, rathan naam har basiaa – the true rathan, the true jewel, the true diamond of the Naam, of the Name of the Lord, of God, of Hari, of that Nourisher of the world, basiaa – has come to abide. In our Ardaas everyday we ask, SIKHAN NOO SIKHI DAN, KES DAN, REHAT DAN, BIBEK DAN, BHAROSA DAN, DANAN SIR DAN NAAM DAN. Everyday we are asking for this gift of Naam. Sathiguru Ram Das Jee is telling us, Guru Amar Das Jee blessed me, the rathan, the diamond of the Name of the Lord God, basiaa – has come to abide within my heearai – within my heart, within my soul, with me at all times. How did this happen? When Guru Amar Das Jee, my True Guru dhariou – placed their haath – their hand, upon maerai maathaa – upon my forehead. What does this mean? The placing of the hand upon the forehead, we may ask how can this happen now with Sri Guru Granth Sahib Jee Maharaj. It happens in exactly the same way. Placing the hand upon the forehead of a Sikh is simply another way of saying gurprasaadh – with the Grace of the Guru. Guru Ram Dass Maharaj is saying it is through the Grace of Guru Amar Das Jee, and is explaining to us that it will be through the Grace of Guru Granth Sahib Jee Maharaj that the Name of the Lord will come to abide in our minds as well, within our hearts and souls. Sathiguru Maharaj is saying if you’re asking for Naam daan everyday, this is the way of obtaining it. By falling to the feet of the Guru, and by being blessed through gurprasaadh, the Grace of the Guru. Guru Amar Das Jee Maharaj blessed me with this diamond of the Name of the Lord shining within me. What happens when through gurprasaadh you are blessed with this Naam? The kilabikh – the sins, of janam janam – of countless lifetimes, and the dhukh – the pain of being being born and dying again and again in reincarnation, outharae – these things left me. All of my sins fell away through the Naam, through the Name of the Lord. All of my pains were eradicated. 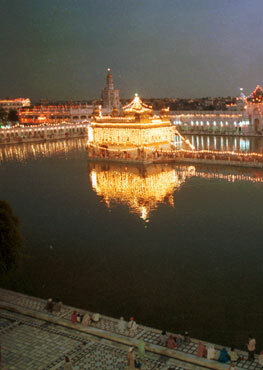 Gur naam dheeou – when the Guru blessed me with the Name, rin laathaa, rin means the debt, laathaa means to be removed. The debts were wiped away, all of these sins which I’d been carrying around with me, all of the pains which were results of these sins of many lifetimes were all wiped out. There were no debts left, there were no accounts left, there was no bad or good, the Guru wiped away all of these with the Naam. Sathiguru Maharaj Sahib Jee is telling us, O Sikh of the Guru, if you wish for all of your pain to be removed, if you wish to merge in with that Almighty Lord God, serve the Guru, and the Guru and his Grace will Bless you with the Naam. Through theNaam, you will be liberated. Maraeman – O my mind, bhaj – meditate, raam naam – on the Name of Raam, on the Name of the Lord, on the Name of Waheguru who is pervading through all. Sabharathaa – for everything, all your arathaa, all your needs. Another way of interpreting this line is maeraeman – O my mind, if you meditate upon the Name of the Lord, then you will receive everything that you need. Any Ardaas that you have, any prayers that you have, any thoughts that you have in your mind, lay them in front of the Guru. This line is also telling us that if you lay your thought in front of the Guru, then the Guru will Bless you. When the poorai – when the perfect Guru dhriraaeiaa – implanted theNaam within me, when the True Guru blessed me and put the Name of God within my heart, within my soul, embodied it within me, embedded it inside my soul, bin naabai jeevan birathaa. Those that have been blessed with the Name of the Lord, how can you tell what they are like? Guru Sahib Jee says that bin naavai – they realise that without the Name, jeevan birathaa – the life is wasted. They say – aakhaa jeevaa visrai mar jaao – if I am repeating, if I am meditating, if I am remembering my Lord God, then it is life for me. If I forget him, then it is like death for me. Aakhaa jeevaa, Guru Nanak Dev Jee is saying, and visrai mar jaao. This is the nishaani, this is the way of telling that the Name is embedded within you. With the Name of the Lord, there is life, and without it, everything is wasted, everything is useless, that is the way gur poorai har naam dhrirraaeiaa, when the Guru implants the Name within you, that is the feeling, that is the state of life, that is the level that those guramukhs have obtained. Rehaoo – Guru Sahib Jee says pause and think about this. Bin gur – without the Guru, moor bheae hai manamukh, we’ve become moor, we’ve become foolish. Why? Because we’ve become manamukh, mind-centred. Those who do not follow the Guru, those who are instead following their own mind, thae moh maaeiaa nith faathaa. Day in and day out, they are entangled in the faathaa, in the noose around the neck, and in the entrapment of the moh, of the attachment to the maaeiaa, to the world, to this transitory, temporary world, to material goods, to material gain, to the pleasures of this world. Guru Sahib Jee says that the only way of salvation, the only way we have liberation is through the Guru, and without the Guru, there is simply only the entanglement of maaeiaa. The mind-centred beings have never saevae, have never served, kabehoo means at any time, n means not. They have not saevae, they have not served the charan, the Lotus Feet of the saadhoo, of the True Guru. Thin sabh janam akaathaa – all, sabh, of their janam, all of their life passes akaathaa.Akaathaa means there is nothing to say about it, there’s nothing remarkable to say. When we say nothing when there is no remark to make, it’s just another wasted life. Guramukh laahaa lai geae manamukh chalae mool gavaae jeeo. It’s only remarkable, there’s only something to say when one wins in this life, when someone man jeethae jag jeeth as Guru Nanak Dev Jee says in Jap Ji Sahib, someone who wins over their mind, wins the world. Then we can look at their life and say Gurasikhaa saabaas janam savaariaa as Bhai Gurdas Jee says in their 'Vaaraan' that those gursikhs who have savaariaa, who have completely devoted their lives to the Lord, decorated themselves with the Name of the God, saabaas - they are great, All Hail! to them. However, if not, then another life just passes away without any meaning. Guru Sahib Jee says jin – those people, those Guru centred beings, those saadhoos, those holy beings who have saevae, who have served the charan, the Lotus Feet, the pag of the Guru, of the True Saadhoo of all saadhoos, the Saint of all saints, those that have attached themselves to the Name of the Lord, which is the Lotus Feet of the Guru, thin safaliou janam sanaathaa. Their janam is safaliou – their life on this earth is completely fulfilled, sanaathaa.Sanaathaa means to be liberated, and sanaathaa means they have a naath, they have a Master, God always above them. They are not masterless, they are not orphaned, they have their mother and father Waheguru always standing with them. O Waheguru Jee, mo ko – make me, keejai means to make me, the slave of those people who with their mind are your dhaas, are your servants, serve you with their mind. Dhaas - who serve you with their bani and their Words. Dhaasanko, and with their sareer, with their body who serve You. Make me the servant of those people. And Guru Sahib Jee says make me the servant of your servants. O Waheguru Jee, the slave of the slave of your servants. Naanak thae mukh oujalae kaethee shuttee naal. The servant of the servants of your servants, O Waheguru, those that serve you, their servant’s servant may I become. Even they are blessed. Just as the fragrance of the sandalwood spreads throughout the whole jungle, in the same way the fragrance of Naam pervades through all of them who do sangat. Kaethee shuttee naal – all of those who are naal, who are with them are also liberated. O jagannaathaa – Master of this world, dhaar – please bless me with your dhaeiaa, with your Grace. O Hari, O Waheguru, make me the slave of the slave of your slaves. The slave of those who serve you with their mind, words and with their body. This is the way of doing Ardass before the Guru. Waheguru Jee, I am andhulae, I am blind, what am I blinded with? Giaaneheen, because I don’t posess the eyes of prem and shardhaa, the eyes of love and devotion. I don’t have giaan, I don’t have any wisdom of your spiritual knowledge. Agiaanee, I am completely without this, in darkness. Kio chaaleh maarag panthaa. Kio – how can I chaaleh, walk upon this maarag, this panthaa, this path to you, O God. To this blind being, O Guru, please bless your anchal, the hem of your robe, grasping onto your robe. This is the way of meeting the Lord, grasping onto the hem of the Guru, grasping onto the robe of the Master, of Sri Guru Granth Sahib Jee Maharaj. However, first we have to accept, first we have to acknowledge that we are andhule, that we are blind, that we don’t have the knowledge. That is one of the hardest things to do, to fall in front of the Guru, to sacrifice all, and to say Guru Sahib Jee, I have no power, I have no wisdom, and I have no strength. Only then can you grasp onto the robe of the Guru, that’s what Guru Sahib Jee is telling us. Please bless me with the hem of your robe. Jan naanak chaleh milanthaa – Sathiguru Ram Das Jee Maharaj says that your servantchaleh - walk along, milanthaa – onto the path which unites me with You. In this shabad today Sathiguru Maharaj Sahib Jee is talking about those Guru centred beings. How are they blessed with the Naam? Through the gurprasaadh, through the Grace of the Guru. How are we going to obtain the Grace of the Guru? By falling to the feet of the Guru, by accepting that we are in darkness, by accepting that there is no other path. Guru Sahib Jee has shown us that there is no other path without the Guru – Bin gur moorr bheae hai manamukh thae moh maaeiaa nith faathaa, there is only the faatha of the moh of maaeiaa, of attachment to this world. May our ardaas be on this day, that mo ko keejai dhaas dhaas dhaasan ko, may we become the servants of the servants of your servants O Lord God Waheguru. Waheguru Jee Ka Khalsa Waheguru Jee Ki Fateh.